Growing up as a young child in Korea, I often visited my maternal grandparent’s house. My grandmother had a traditional Korean kitchen that uses wood burning stove. She had a huge ( I mean really huge) iron pot permanently installed on the stove. The memory is vivid. I can picture the scene of her wearing Korean traditional dress called “Hanbok” and her hair – somewhat similar to bun donut hair – that was secured with a humble hairpin. She squatted down to keep the flame on going by adding more wood to the stove. As a child I squatted down next to her and watched her how she control the flame to cook perfect rice. My grandmother was not a chatty woman. She was always quiet and calm. 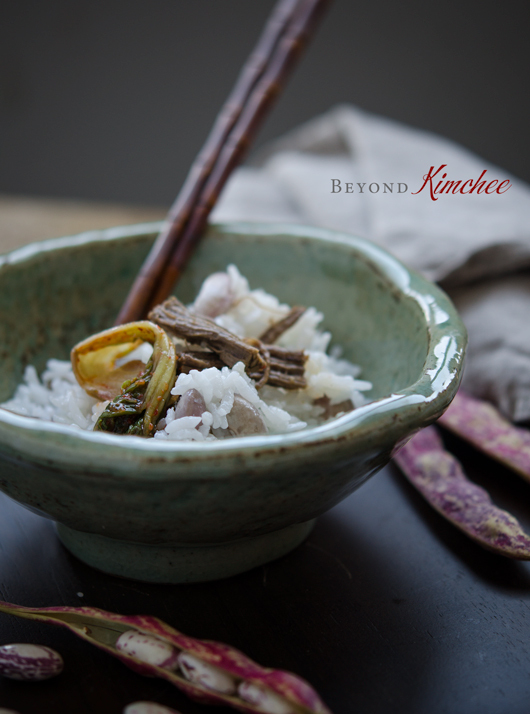 I don’t remember talking much with her but my memory of her freshly cooked rice with her stews and other rustic Korean dishes are like a tattoo on my brain. She was known for a very good cook in her neighborhood. Especially her homemade Korean bean pastes and soy sauces were so good, people from other towns came to buy from her. 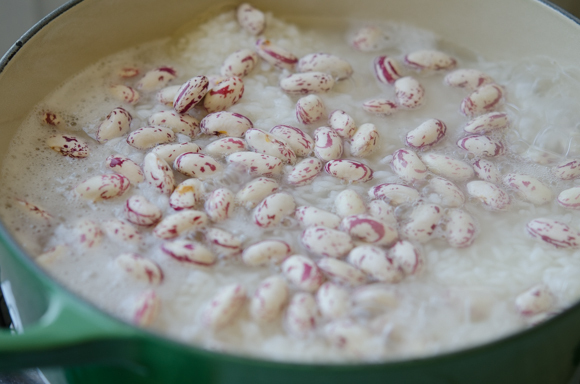 During the summer time when the fresh beans are abundant, my grandmother often added the fresh beans in her rice. Well, I am not going show you how to cook my rice in a humongous iron pot on the wood burning stove with an open flame. You can do that if you are camping out. Living in a modern convenience, you can cook your rice in a electric rice cooker with a touch of button. 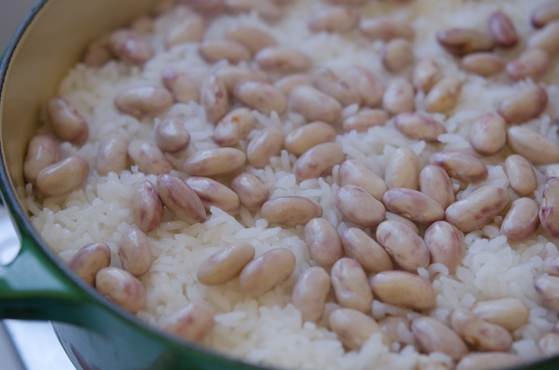 But with the addition of fresh beans, rice tastes better if you cook in a pot on the stove. I hope you can find some fabulous fresh beans in their pod at the market. It can be any beans or even fresh peas. 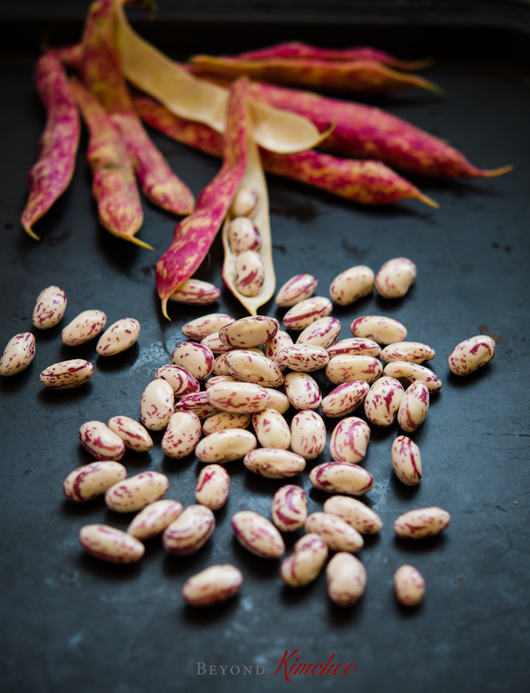 Beans will add the great nutrition to your rice and rice cooked with fresh beans goes so well with many Korean dishes. To be honest, I don’t use any measurement when I cook rice on the stove. I have cooked rice in a pot so many times, I can just eyeball it. But I know if I tell you to eyeball the amount of water to the rice, some of you might not be happy to hear that. So here is some guideline that you can use. But I recommend to soak for 30 minutes if your time allows. It enhances rice to cook evenly and brings better texture. When you cook pre-soaked rice, the ratio would be 1:1. Make sure 새drain the soaking water and pour new water to the rice when you cook. The type of pot you use makes a little difference, too. 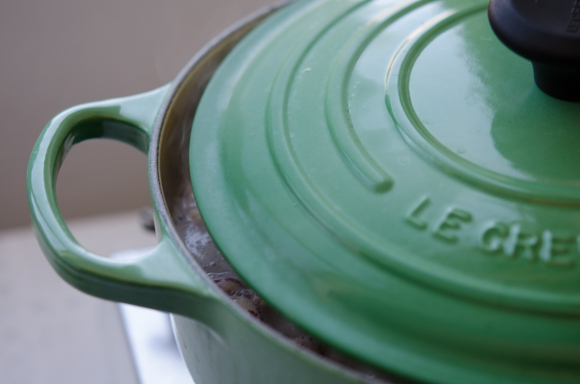 I recommend a heavy lidded Dutch Oven or a cast iron pot. They will keep the rice cook evenly without loosing much steam inside. First, you want to bring the rice to a full vigorous boil over high heat and cook for 1 minutes uncovered. This will enhance the rice their stickiness. Then reduce the heat to med-low and cook for 5 minutes. Halfway during this 5 minutes of cooking time, add the fresh beans. Do not stir to combine. Don’t bother your rice. They will do their job their way! After I added the fresh beans, I like to cover the lid but leave a small space for the steam to escape. After the 5 minutes, the water in the pot should be evaporated mostly. Cover with a lid completely and simmer over low heat for 10 minutes. Then, turn off the heat and let it sit for 3 minutes or so. Your rice should be ready to present. I call this gorgeous! Oh, the fresh steam coming out of pot when you open the lid! This rice is calling me, babe! You want to fluff the rice ever so gently for the beans to get mixed well with rice without smashing them. Your rice is ready to accompany any Korean dish. My grandmother passed away when I was 11 years old. She had suffered stroke for 2 years. It was rainy summer day when she took her final breath. I saw a small rainbow in the sky after the rain was gone. I heard people comforting my sobbing mother that my grandmother went to a very nice place in heaven as they pointing out to a rainbow as a good sign. My grandmother’s kitchen was gone soon after her death and so her humongous iron pot, too. But I still cherish the memory of her squatting in her old kitchen controlling the flame under the stove to bring perfectly cooked rice in an old fashioned way for her family. That was one of the way she showed her love to her children and I deeply appreciate her. Wash your rice with a swirling motion and rinse out 2-3 times until the water runs clear. Soak the rice in the water for 30 minutes. Drain the rice and discard the soaking water. 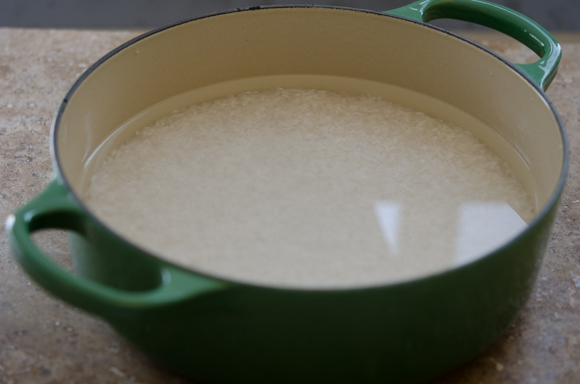 Place rice in a heavy bottom pot, such as a dutch over or a cast iron pot, and pour 2 cups water. Bring the rice to a full vigorous boil over high heat and cook for 1 minute uncovered. Reduce the heat to med-low and continue to cook for 5 minutes. Halfway through the 5 minutes of cooking time add the fresh beans and cover with a lid, but leave a small space for the steam to escape. Toward the end the water should be mostly cook off, cover completely with a lid and turn the heat to low, and simmer for 10 minutes. Turn off the heat and let it sit for 3 minutes for the steam to reincorporate inside the pot. 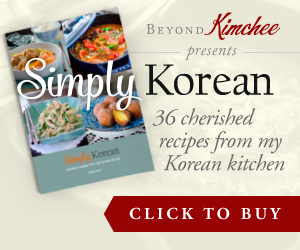 Serve your rice hot with the delicious Korean dishes of your choice. You can replace the beans with fresh peas or even skip them if you don’t care for them. [br]The amount of water can be adjusted depends on the pot you use. 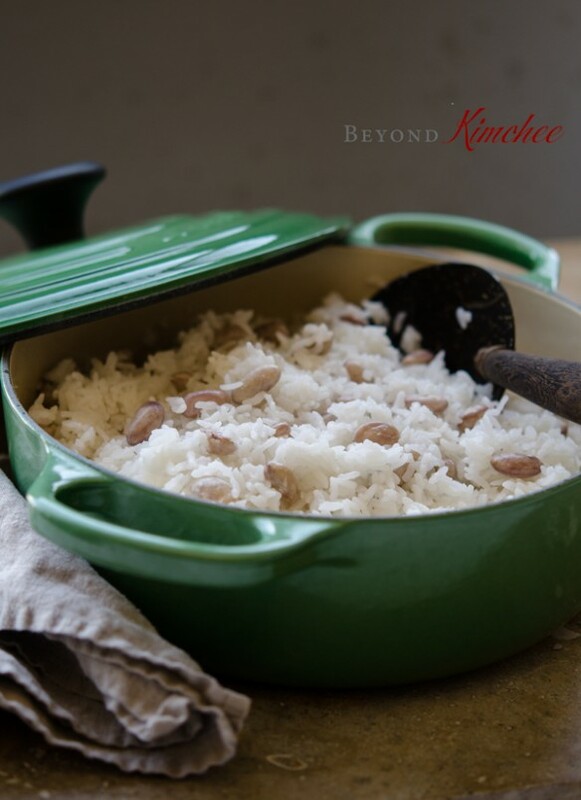 The heavy bottom dutch oven or cast iron pot have a heavy lid and it can keep the steam more effectively during the simmering time, which creates tender rice without much liquid. Thank you for such a heartwarming and lovely memory of your grandma! I've never cooked beans with rice but they look so colourful and yummy that I'm tempted to try. I love the soft blue-green (celadon?) glaze and shape of your rice bowl btw. Thanks Jeanne. The soft blue green rice bowl is from Korea. I love it, too! 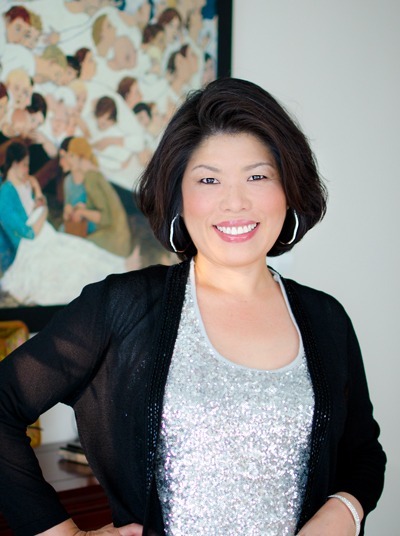 Thanks for sharing your beautiful story and recipe with us! Thanks for reading, Steph. Hope you get to try cooking rice on the stove! I add beans to cooked rice all the time, but never cook the beans with the rice. Fun idea! Thanks for this. Yes, it makes rice more exciting and tasty. Thanks John! 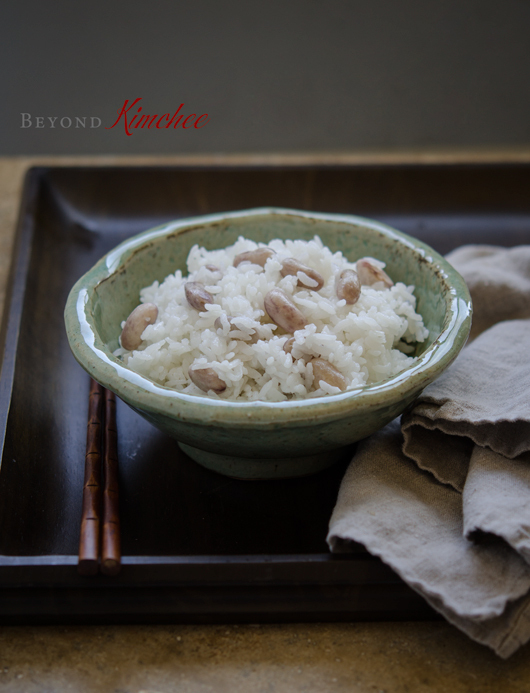 Rice mixed with various types of beans is common in Korea. 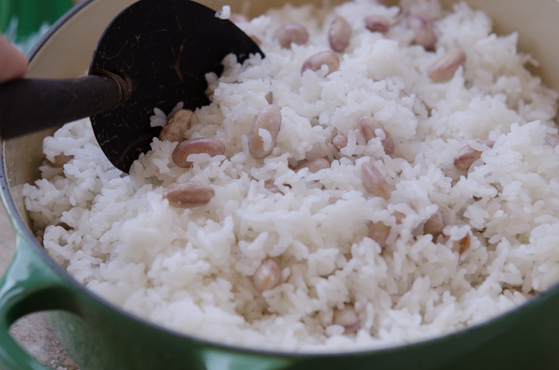 It brings more texture and flavor to the plain rice. I've never tried this type of beans, but I can imagine this rice will go well with all the korean dishes! I made this for my husband and me last night and it was AMAZING and so easy. Thanks for the great, easy recipe! Five stars!!! That is just wonderful, Sarah! I am glad that both you and your husband liked it. Helllllo meeee again. Loving your blog. Do you have a fool proofed recipe to making egg fried rice..? Apologies if it is on the site but have not been able to locate it, if it is. Beautiful memory. Thank you for sharing it!!! Thank you for sharing your story about your grandmother. She sounds lovely and I can just picture her hanbok making yummy rice in the old fashion stove. I'm glad you still have lovely memories of her. Thank you for sharing!